In the nest of winding streets between the Palais Royal and Opéra, a batch of Japanese restaurants and businesses unassumingly sprout out of the area’s Haussmannian buildings to form one of the best Paris secrets: a booming Japanese quarter. Not only is the quarter the city’s culinary hub of Japanese cuisine, it also boasts a variety of specialty grocery stores and tea parlors, as well a handful of French cultural attractions such as the quaint Passage Vivienne, the beautiful Palais Royal and the Richelieu branch of the Bibliothèque nationale de France (BnF). Kmart has been stocking Franco-Japanese pantries for years. Developing with the influx of Japanese tourists to Paris, the quarter’s strategic, yet unexpected, location allowed business owners to escape the exorbitant rents near the Champs-Elysées while still managing to intercept the stream of Japanese tourists following the traditional Eiffel Tower/Champs-Elysées/Opéra Garnier circuit. 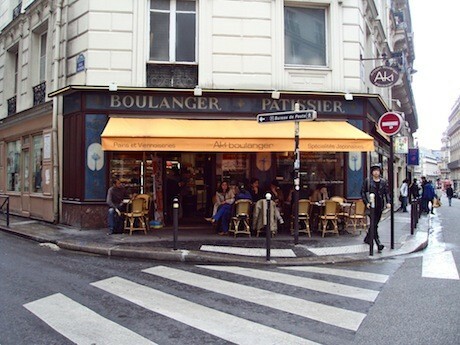 In the absence of a large expat community, the restaurants and business in the neighborhood continue to cater to these tourists, all while enchanting Parisians drawn by the numerous ramen (or lamen) and sushi restaurants. To guide your discovery of one of the loveliest Paris secrets, we’ve drafted a loose itinerary to set the ball rolling. 14, rue Molière, in the 1st Arrondissement. 01 42 96 08 38. Open Sat–Mon, 7 p.m.–10 p.m.; Tues–Fri, noon–2 p.m.
32, bis rue Sainte-Anne, in the 1st Arrondissement. 01 47 03 38 59. Rendezvous at Takara, one of quarter’s founding restaurants, which, until recently, drew an almost exclusively expat clientele. Just because this Paris secret is out doesn’t mean that the food and atmosphere have suffered. Round up some friends to share a satisfying nabemono, the restaurant’s specialty hot pot, or nosh on an some of the city’s best sushi. 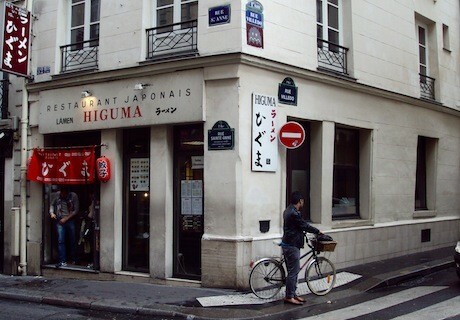 If ramen sounds more like it, we suggest you grab a table at Higuma nearby. We’re not talking about the inexpensive pouches of ramen that got you through college. This Japanese delicacy is cooked with care and packed with flavor. 16, rue Sainte-Anne, in the 1st Arrondissement. 01 42 97 54 27. Open Mon–Sat, 7:30 a.m.–8:30 p.m.
We hope you’ve saved room! Aki Boulanger, which joins the rue Sainte-Anne and the rue Villedo, bakes up a selection of fun French classics with a Japanese twist. 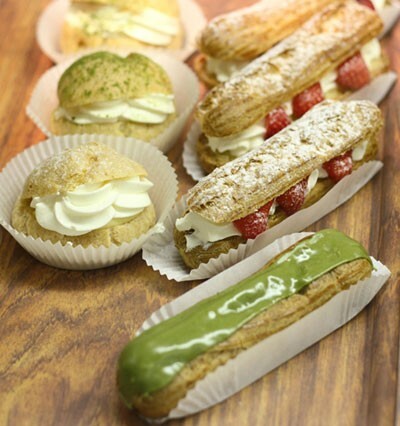 An abundance of colorful green tea macarons and lychee religieuses, to name a few, pack the shelves at this unusual boulangerie. 8, rue Sainte-Anne, in the 1st Arrondissement. 01 58 62 49 09. Whether the day’s culinary experiences have inspired you to whip up your very own Japanese meal or you’re just curious, check out Kmart on the rue Sainte-Anne. 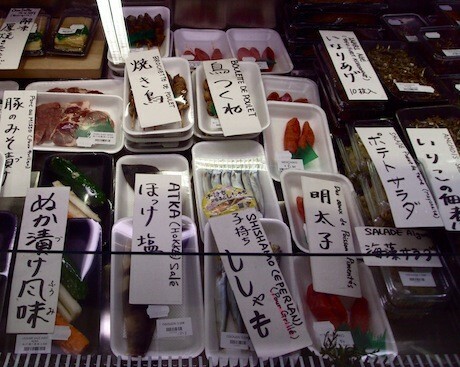 This specialty grocery store has been stocking Franco-Japanese pantries for years. You’ll find soba noodles, nori, various dried mushrooms, taro, mirin, an assortment of green teas, pickled fish and much, more among the range of products. 13, rue Chabanais, in the 2nd Arrondissement. 01 42 96 27 28. Open Mon–Sat, 11:30 a.m.–11 p.m.
2, rue Chabanais, in the 2nd Arrondissement. 01 42 96 17 32. All this eating and strolling around must have left you parched! 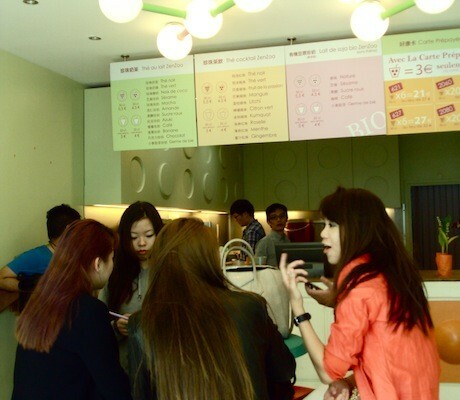 What better way to hydrate than with a tasty bubble tea at ZenZoo? The flavors vary from refreshing mango to smooth and creamy matcha. While the gummy-like tapioca balls don’t add much in terms of flavor, their fun texture is half of the experience! Take a seat at the restaurant on the corner of the rue Cherubini or grab a cup to go at the tea shop for a lush denouement at the Square Louvois.